The best part of today’s K-Day de Delay was Joel. He and his family moved here from (Chicago?) several months ago. He’s been a collector for years, but today was his first K-Day. He really had a good time. There was also great camaraderie, with K-Day regulars such Adam and Jayce.There was only one case this time (I don’t know if that had something to do with Irma or not), but everyone was gabbing and joking and sharing photos. Personally, I think this was the best K-Day we’ve had in a long time. New! For 2017! Which is nearly over! 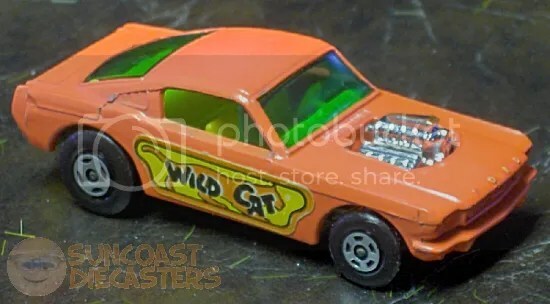 This Firebird, with its hoodless engine, is cool enough as it stands. But that it’s also based on Brendon Vetuskey’s own vehicle makes it that much cooler. I presume Mr. Vetuskey’s vehicle is, you know, full-size. I hope your K-Day experience went well. See you at our October meeting! K-Day Southeast is this Saturday! And yes, we’re late. A busier-than-expected (and unexpectedly modified) work schedule, a frustratingly difficult home improvement project, and various other things all added up to a pushed-back January 2017 update. Also, not a lot of activity in this update, as the post-holiday meeting is usually slow for us. On the other hand, good news: The February 2017 K-mart in-store event and mail-in promo are now on our Calendar! Oh, and I finally activated the “Tag Cloud” widget on the left over thar. Enough delays already! Let’s get to the photos! Heh. You older readers may very well recognize that as the opening lyric of Red Simpson’s country-western novelty tune, I’m a Truck. And to you younger readers, yes, there really is a song sung from the point of view of a truck. For context, just think of it as Optimus Prime sings There’s a Gear in my Beer. Bill bought this model from Big Tractor Mike. By the way, “truck” actually has a name. 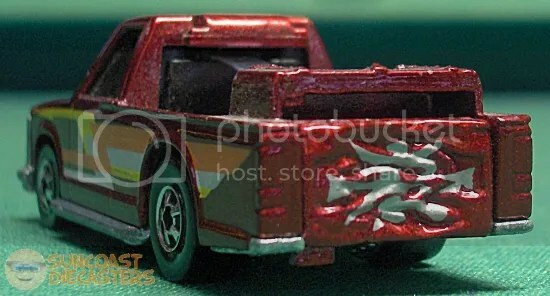 Back Biter is from Hot Wheels’ interesting concept series, Crack-Ups. Each model in this series is gimmicked with a spring-loaded panel which upon impact would unlatch and spin around to reveal simulated damage. This addressed (or attempted to) the playtime conflict of wanting to crash one’s toys without actually causing damage. When done playing, the child (or Bill) could just rotate the panel back. If only real vehicle damage were so easy to repair. Crack-Ups models would have the gimmick panel on the rear, front, side or even on top. 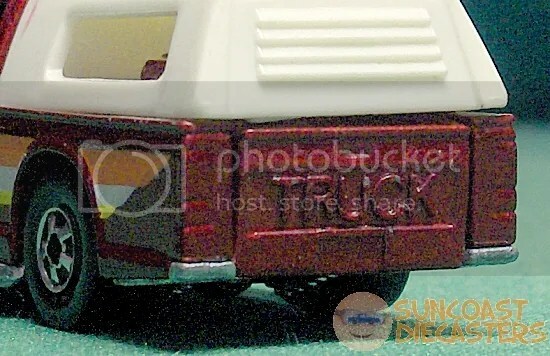 A “bonus feature”, as it were, of ol’ Back Biter here is that the camper top would also fly off, enhancing the “damage” effect. See that plastic tab? That’s actually the spring which launches the camper top. 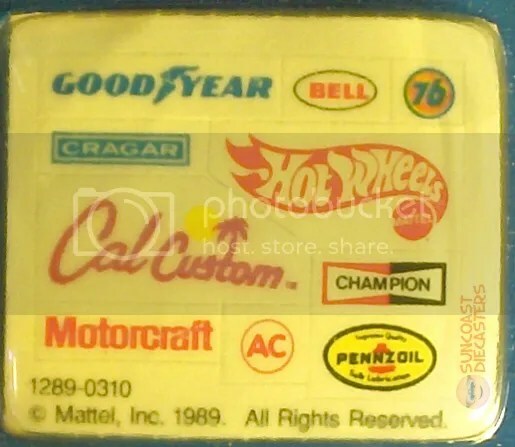 I’ll be honest: When I first saw that tab, I thought it was one of those battery separators … until I remembered that Crack-Ups came out decades before pre-installed batteries in toys were commonplace. Bill also bought this snazzy boat-&-trailer combo known as Seafire. Well, the boat is Seafire; the trailer has no name. In case you’re wondering whether the boat separat– Uh…. Hello, ladies. I’m Dash Handsomely. For goodness’ sake. Anyway, in case you’re wondering whether the boat separates from the trailer, yes it does. Yet Seafire remains mobile, as it has rollers underneath, which I’d be happy to show you except I forgot to photograph the bottom of the thing. Ironically, Seafire is roadworthy but not seaworthy. What you’re seeing … is an optical illusion. The trailer is *not* actually attached to the truck! Along with loose cars and boxed sets, BTM has several very nice glass-topped display cases. 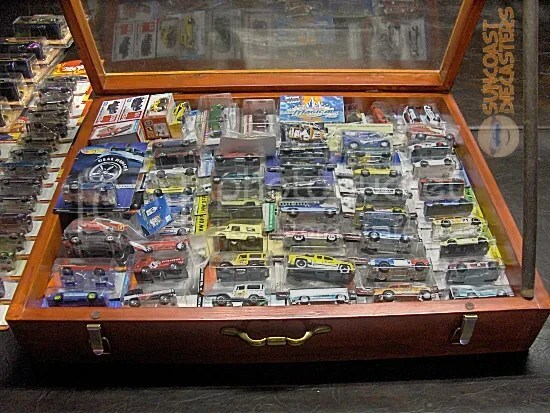 Here, Jason provides some friendly competition with just such a display case of his own. A rat rod from the mouse house! (Sigh) If only I didn’t have bills to pay. 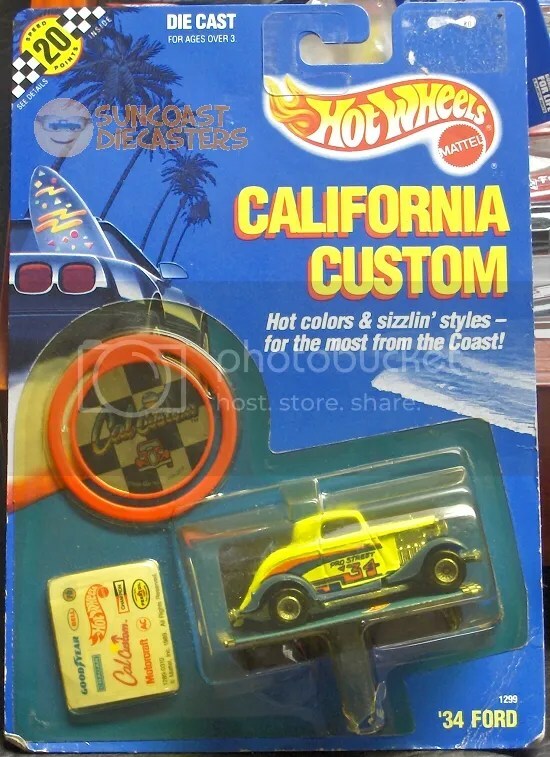 Okay, that’s not an ad but the back of this front, another of Hot Wheels’ concept series, California Customs. 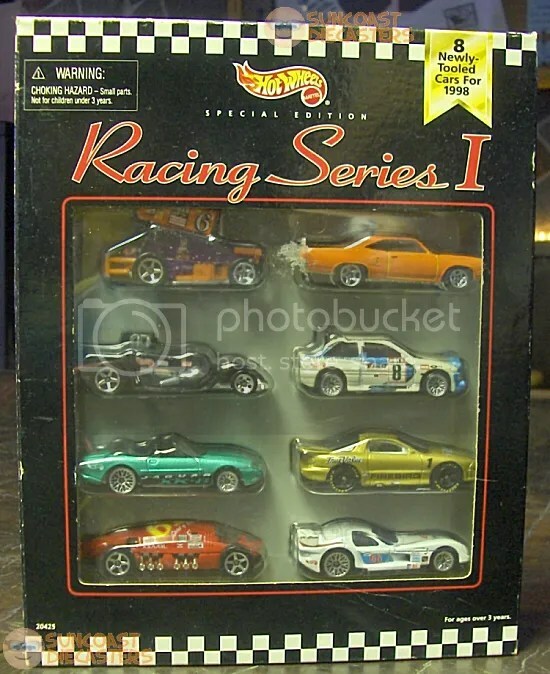 This series featured mainline models done up in very bright colors, and included a plastic medallion as well as a sticker sheet fo further customize the model. Emergency Back-up Ken bought this from Ed. This model’s sheet features licensed automotive supplier brands. While the blister has yellowed a bit with age, and there are a few minor crumples along the card’s edge, this model is otherwise in very good condition, and in that most rare of states, complete on its card. 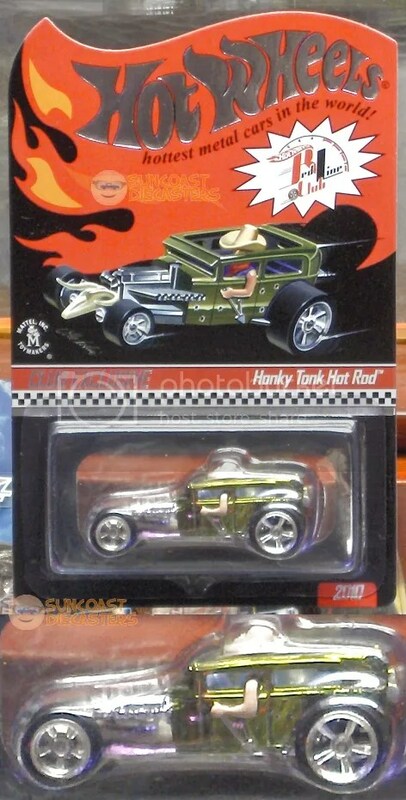 Ergo, I readily declare the Cal Customs-series ’34 Ford to be Suncoast Diecasters‘ Find of the Month(*) for January 2017! November transforms into a Big ‘Bot Bonanza! Well, you’ll figure it out once you get to the official from-the-meeting photos. However, I wanna do something a little different first. I rarely put photos above the blue horizontal break. 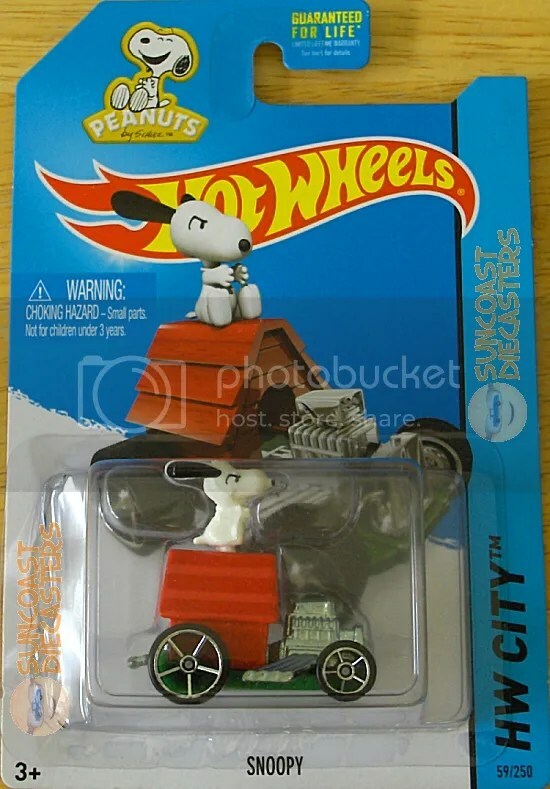 However, since the final K-mart Collector Day of 2014 fell on the same date as Suncoast Diecasters‘ November meeting, I’m setting it off separately. Yep, I put all the other models back on the pile because, as I looked them over again, the only one that really made me happy was ol’ Snoopy. …I wonder he still thinks he’s piloting a Sopwith Camel? Hey, maybe we’ll finally see that ”Flyin’ Aces III” series we’ve been longing for! Here, before going to the November photos, this will make you feel better. Big Tractor Mike surprised Krista with this commemorative trinket purchased from the gift shop of the Arkham Asylum. Hashtag Gotham, y’all! 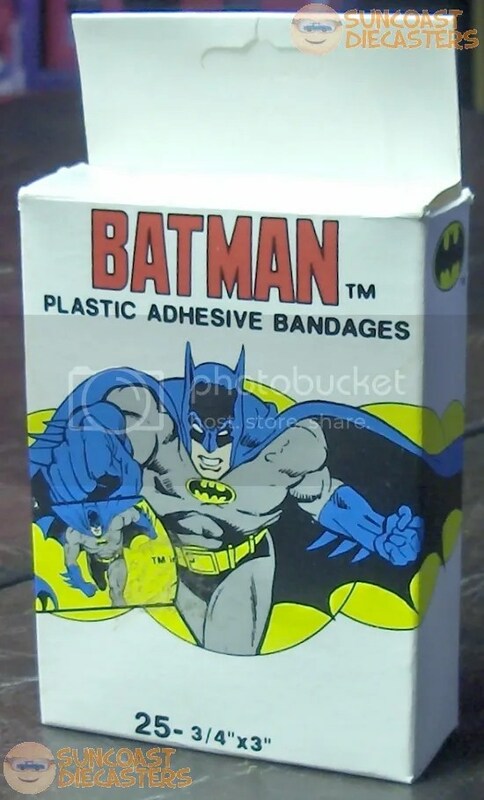 This episode of ”Suncoast Diecasters” is sponsored by Batman(R) brand batdages. Okay, now you see why I made the somewhat oblique reference to Transformers. I brought several Generation 1 toys to our November meeting; and Big Tractor Mike, why, he done bought ’em all! First is good ol’ Sludge here, without weapons or accessories but still in very good condition and functionally transformationable. Me Sludge not a car! Next up is Hot Rod. Again, no weapons or accessories, but still quite fashionable. And by that I mean — and those who know will understand this — he has metal shoes. And I don’t mean brake shoes. The sensible family sedan of the future. 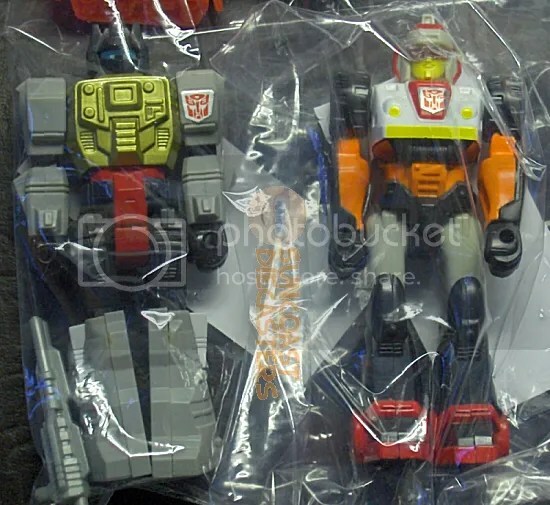 Next are several complete Action Master figures. 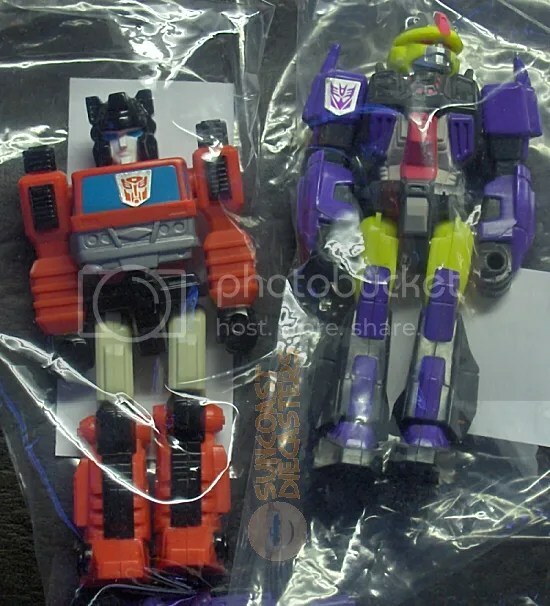 Here we have Inferno and Krok. 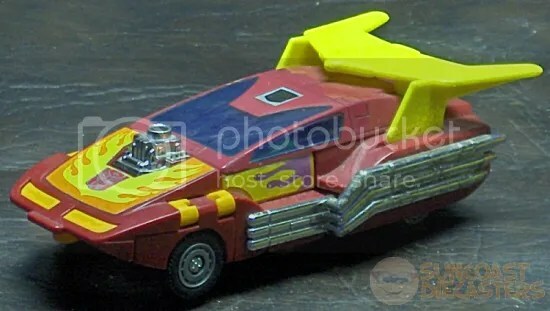 Inferno is a classic character from the early days of Transformers. Krok, like Howitzer Explosion Guy, was made up for the war. You’re a Mitsubishi firetruck that permanently turned into a giant Japanese robot? What a Krok! Here we have Autobot Dinobot Grimlockbot III, Esq. Or, just Grimlock, to his friends. Next to him (but in his own personal baggie) is Kick-Off. Me Grimlock think someone no manage his trademark very well! 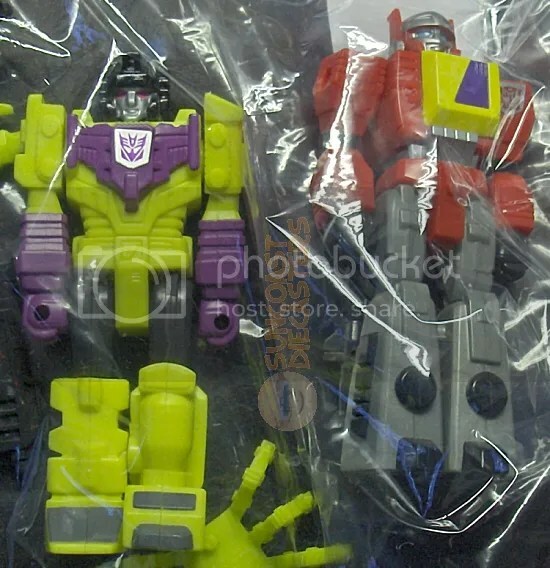 And finally we have Devastator and Blaster. Devastator is famous for 1) being the first combing robot toy and 2) being impressively large when all six Constructicons are combined. Blaster is famous for being the Autobots’ attempt at stealing some of the cool from Soundwave. Because six heavy-duty construction vehicles have *exactly* the same cubic volume as one boombox. BTM and I did a “plus cash” trade. 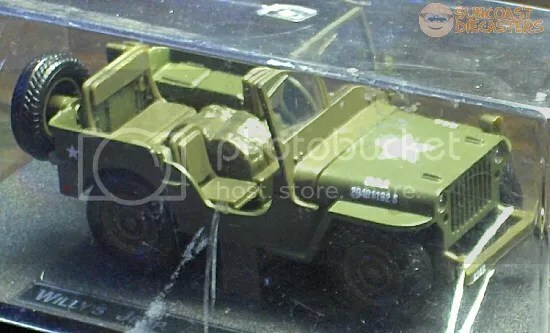 He got, plus some cash, this sweet Willys jeep, by New-Ray. Wonderfully detailed, and securely bolted into a very convenient ready-for-display case. No scale is stated; it’s larger than my 1/43s, but smaller than the 1/24 NASCAR models which show up occasionally, so I’m guessing it’s in the 1/32 range. …And his name is Eugene. And what did I get? 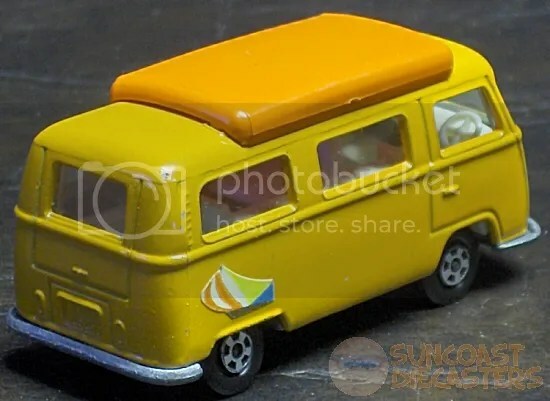 Oh, just this delicious Matchbox Superfast Volkswagen Camper. It’s in beautiful shape, with just the teensiest of little dings here and there. A very thoughtfully-sculpted casting, it even includes the “louvers” on the D-pillars. Of *course* it’s from the ’70s! 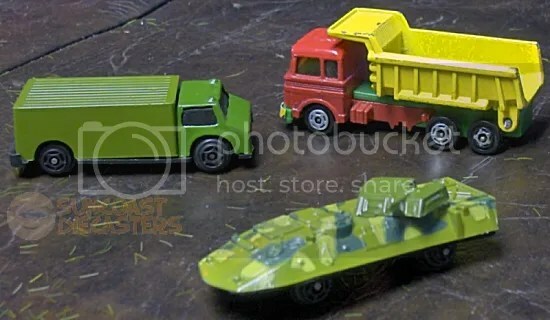 Ken hired the No-Name Army — represented here by a rather squattish truck and what appears to be an amphibious tank — to protect his No-Name Dumptruck. Ken purchased from me this Target Exclusive boxed gift set of … I dunno, dishes? Outerwear? Whatever. No, there never was a ”Series II”. 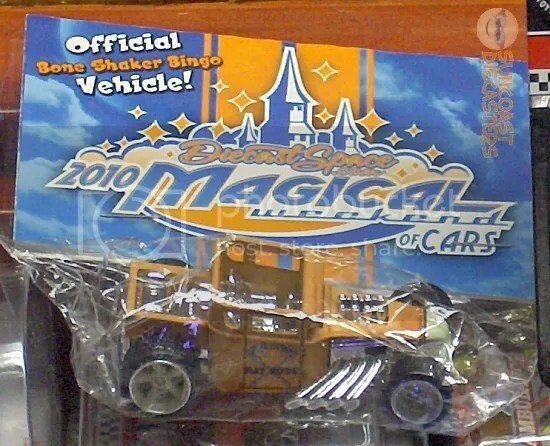 In authentic ”garbage truck” colors, too! 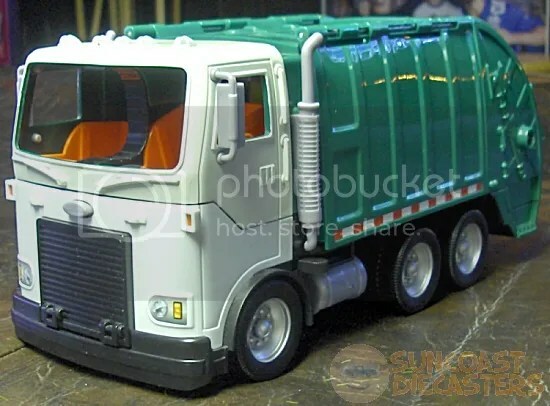 …But he also gets this snazzy Toy Story 3 Tri-County Landfill playset which hides inside the truck in which it resides. It also incidentally ties Ken back to BTM’s Transformers-fest above. 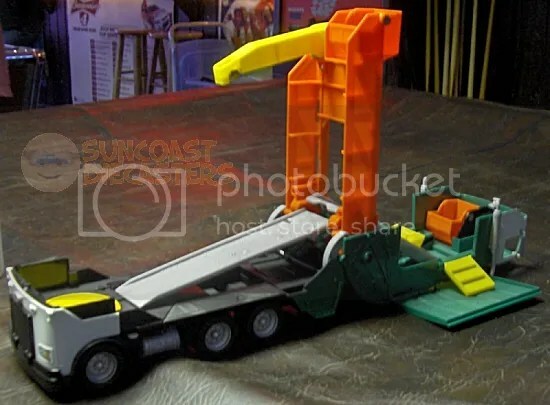 And how does the garbage truck become the playset, you ask? Here in Pinellas County, we have the Toytown Landfill, but it’s nowheres near as much fun. Why, in this engineerfully delightful manner, that’s how! Much, *much* cooler than One-Step Bumblebee. 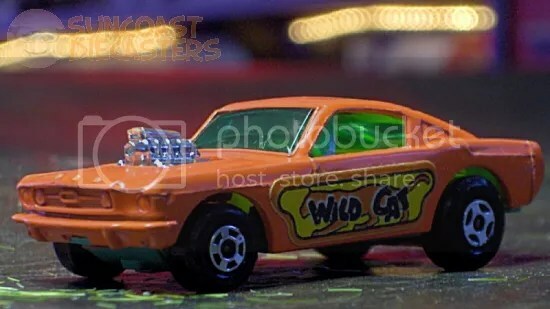 Now for Ken’s piece of resistance – the Matchbox Wildcat Dragster. This is one sweet, wild ride. It seems to represent a curious time in 1/64-scale car design: on one hand, it features an appreciably well-sculpted body casting with full interior and powerful engine. On the other hand, it sports a cartoonish, almost garish color scheme which makes it look less like a well-crafted miniature and more like, well, a toy. 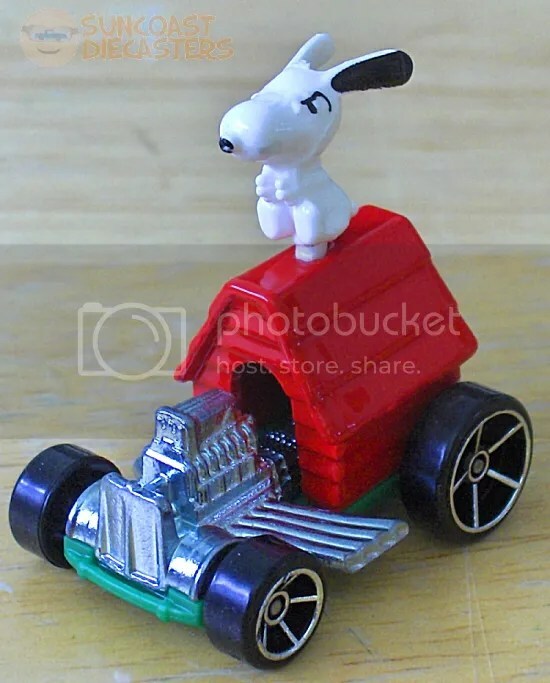 It’s as if Matchbox couldn’t decide whether the item was meant for kids or adults, and attempted to split the difference. Or, maybe Matchbox perfectly targeted adults who are kids at heart. Nonetheless, the Wildcat is in beautiful, almost pristine condition. I normally don’t post chassis photos; they mainly serve to ID the make, model and year (just like a real car!) for post text. 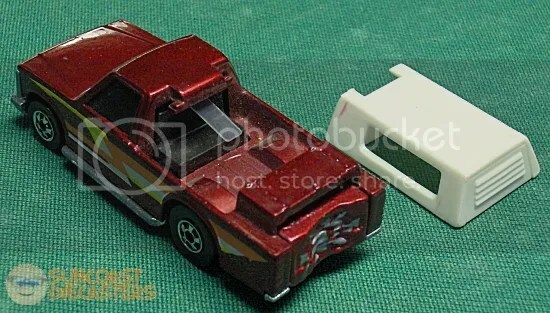 And of course, the chassis, or base, is usually unpainted or chromed ZAMAC. You know I’m impressed when I include a base photo specifically because its paint is also in such good shape — whatever color that paint may be. ”Seafoam Green”. That’s my best guess. 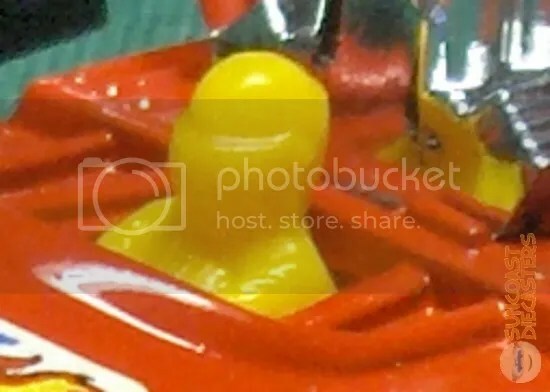 Suncoast Diecasters accepts no responsibility for you ruining your keyboard by drooling on it. Hear ye, hear ye: the Final K-Day Event of 2014 will be this Saturday, the 8th of November. 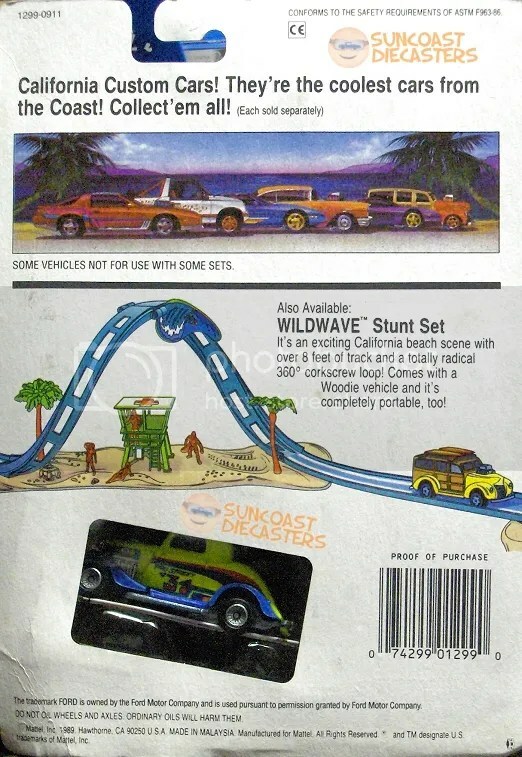 It will again feature Special Colors vehicles and First-to-Market vehicles in the in-store event. You can also collect your twenty (20) traders for the mail-in promo limited-edition vehicle.